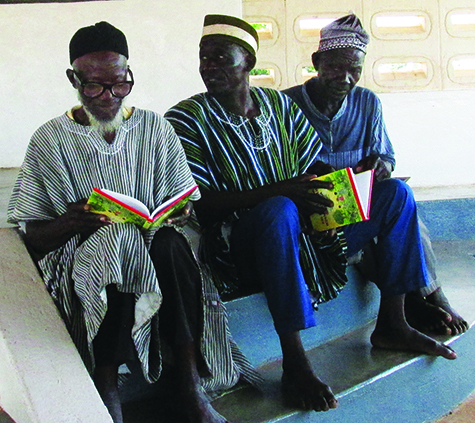 Tribal chiefs in Ghana – who are idol worshippers – read God’s Word to them in LHF’s Kusaal language edition of A Child’s Garden of Bible Stories. The blood of Jesus not only protects, but it also enlivens our quest for eternal life. It transforms us, vanquishes fear and makes us free to love our neighbor. It is the love for our neighbor that has motivated the Lutheran Heritage Foundation to serve many countries in the world by translating, printing, publishing and distributing the good books that Luther and others wrote. Ghana and many other countries are deeply blessed as Muslims and traditional religion practitioners are reading Luther’s Small Catechism, A Child Garden of Bible Stories and other translated books. In 1517, Martin Luther professed that indulgences and other human merits were not a requirement for a baptized child of God, who has been sanctified by the Holy Spirit. Today, the Lord is using LHF to continue the work of Luther by making the Small Catechism and other important books available to both Christians and non-Christians so that they will read, believe and understand that not one dollar is needed by God for forgiveness of sins, life and salvation. It is all free.